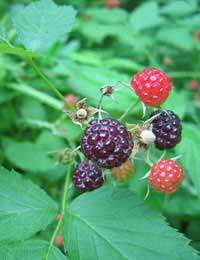 The ‘look’ of a particular plant or berry is simply not enough and if you can’t identify it, then the advice is to leave it alone and not to risk eating it. Therefore, if you’re out in the woods, it’s useful to have a basic knowledge of the vegetation that grows in a specific area you’re visiting and know how to identify which plants are safe and which are toxic. Hunger pangs are highly likely to ‘kick in’ if you are stranded for some time without food but it’s important to remember that you can actually survive for a few weeks without food as long as you have enough water to sustain you. Therefore, no matter how abundant and tempting plants and berries might be, you should never eat any wild vegetation unless you are 100% sure you can identify it. There is a vast range of things which grow in the wild, which are safe to eat and will help to keep you nourished when faced with a survival situation. Dandelion leaves can be eaten raw or cooked, the roots make a welcoming hot drink (if you're not in a survival situation and want a natural snack, the flower itself can be dipped in batter and made into a fritter). Nettles can be steamed or boiled and make a useful substitute for your ‘greens’ and of course, there’s nettle tea! The roots of the burdock plant can be boiled and then eaten like potatoes and pitted rose hips are packed with vitamin C. You may also find more common foods like blackberries, blueberries and strawberries. However, be absolutely sure you know what you are eating before putting it in your mouth and also remember that some wild plants need to be cooked before they are safe to eat. Anything that has thorns or spines you should treat with suspicion and unless you are highly knowledgeable about mushrooms and fungi, you should keep away from as, although you can eat many fungi, some of them are deadly. Many people fall ill because they assume that if an animal is eating a particular plant or berry, then it must be safe for humans. This is not the case. Also, make sure that if you’ve found what you know is a patch of plants that are edible that all the plants you gather are the same species, as there may be similar looking plants growing in the same area but which are highly dangerous. You also need to know which plants need cooking first to make them safe as some plants are still harmful if you eat them raw. Some survival books will show you how to do an edibility test on a particular plant if you cannot identify it. This is a quite lengthy process beginning with testing a small portion of the plant on your skin to see if it causes an allergic reaction, then on your lips and tongue etc. but it is a painstaking, lengthy process and doesn’t offer a 100% guarantee as to the plant’s safety and should only ever be used in an absolute emergency. There are plenty of resources on the internet to show you how to conduct a plant edibility test but you should treat these with some caution. The only way is to be sure that you have identified the plant in question is by doing your research in order to be confident about what is edible and what isn’t.